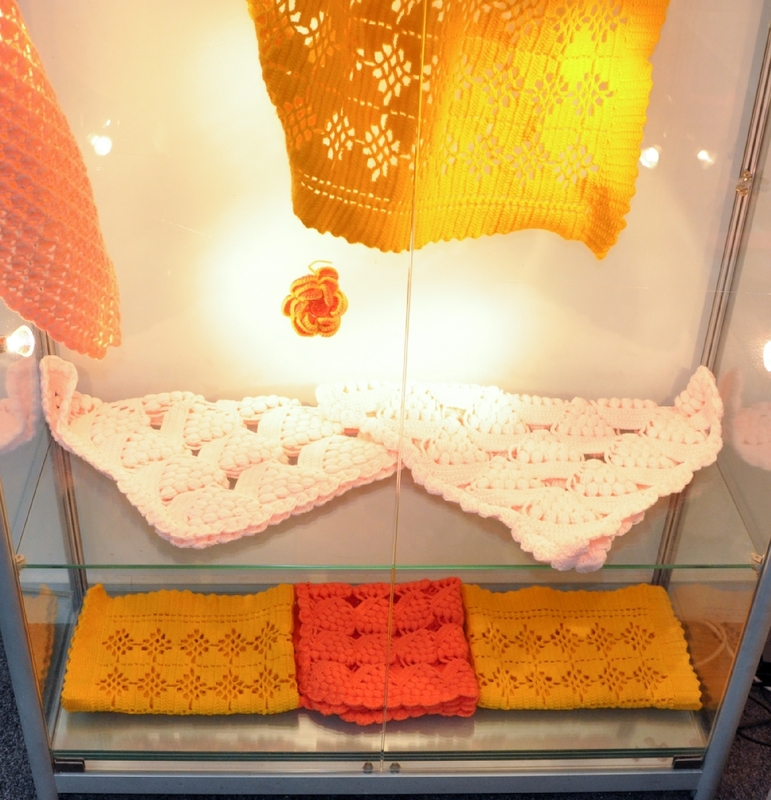 The knitted works here are by Lili Golmohammadi, who leads the course Crochet and Knit Night Out (Fridays 6:30 to 8:30pm) and students Elizabeth Lakoli, Rabeya Ahamed, Allyson Amoroso, Cee Callender, Gillian Eden, Khadijeh Khedri, Haregu Menghistab, Karen Pennicott, Kemi Pennicott, Marianne Rouvier Angeli, So May Tang, Valentina Vanegas, and Maria Vigouroux. 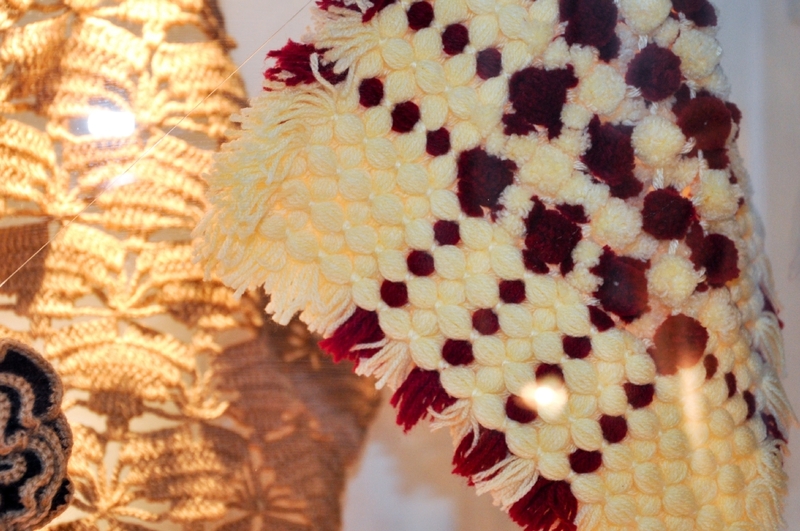 Golmohammadi exhibits a jumper that displays her interest in the ambivalent clash between hard and masculine motorcycle culture, versus the soft domesticity of knitting. 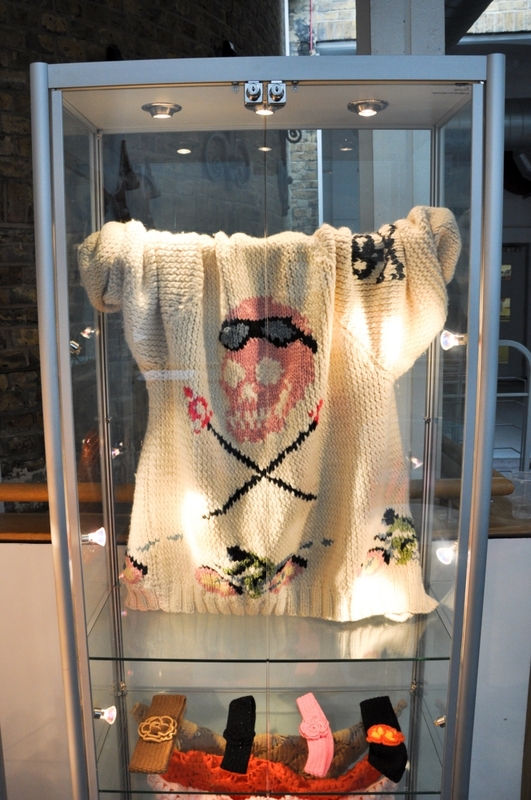 The imagery of a pink skull with sunglasses that is embedded within the white heavy wool creates an intriguing scene where the two seemingly contradictory worlds collide. Meanwhile, the rest of the cabinet is occupied by Lakoli’s vibrant and rhythmic patterns. 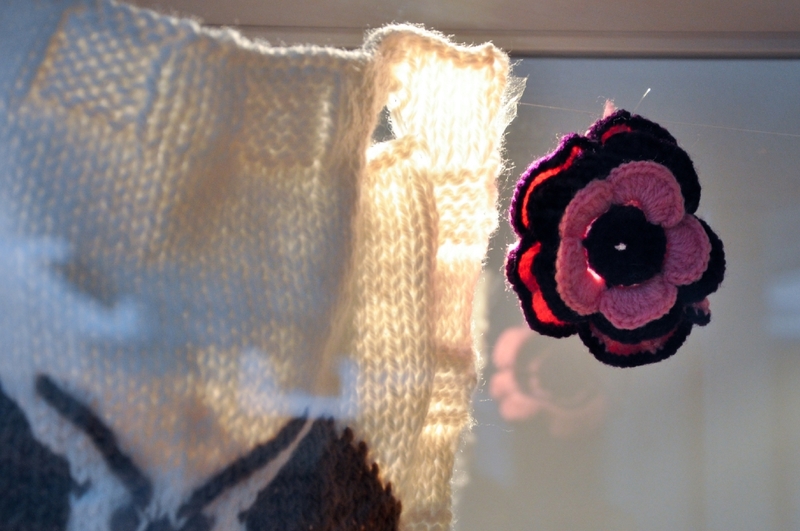 Soft pink, ochre, brown, and purple flowers are hung delicately, illuminating the material and versatility of yarn. 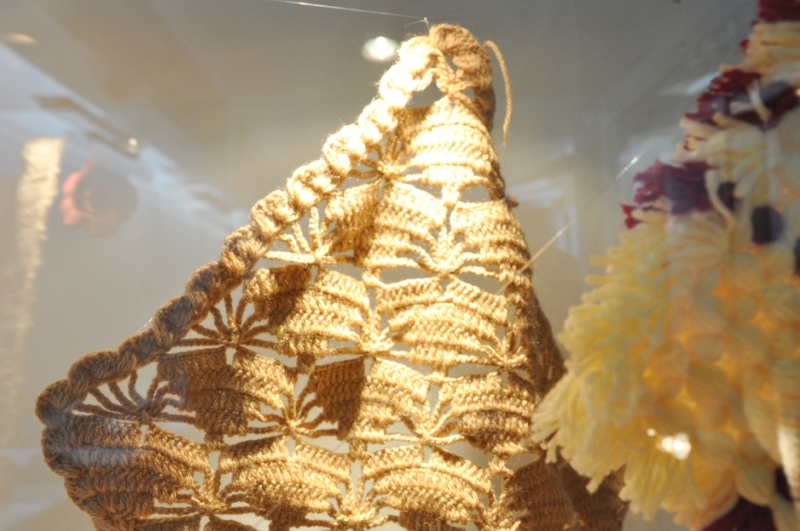 Not only are Lakoli’s techniques emphasised through the display, but the suspension of knitted or crochet materials aim to engage a different perspective and experience of knitted objects. 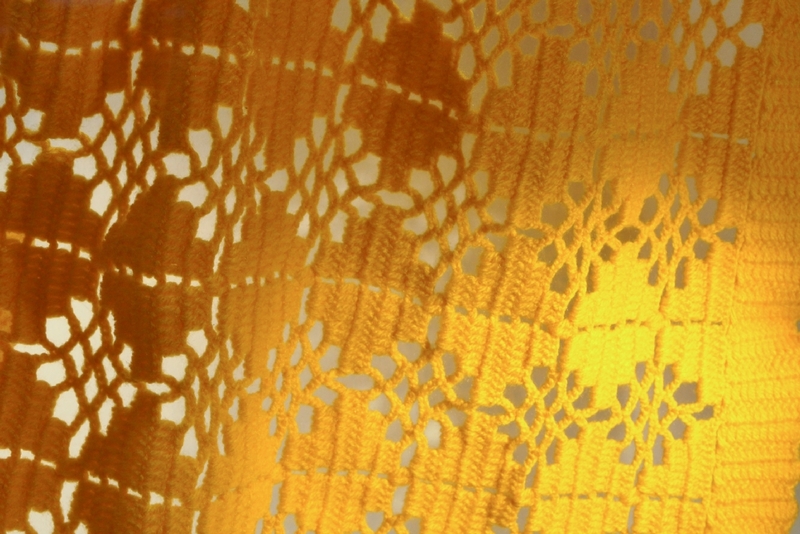 On the far end of the wall, an ongoing bunting project by the students of Crochet and Knit Night Out extend and meet the works of Neil Stoker who uses linen thread to create an ephemeral and inconspicuous installation. 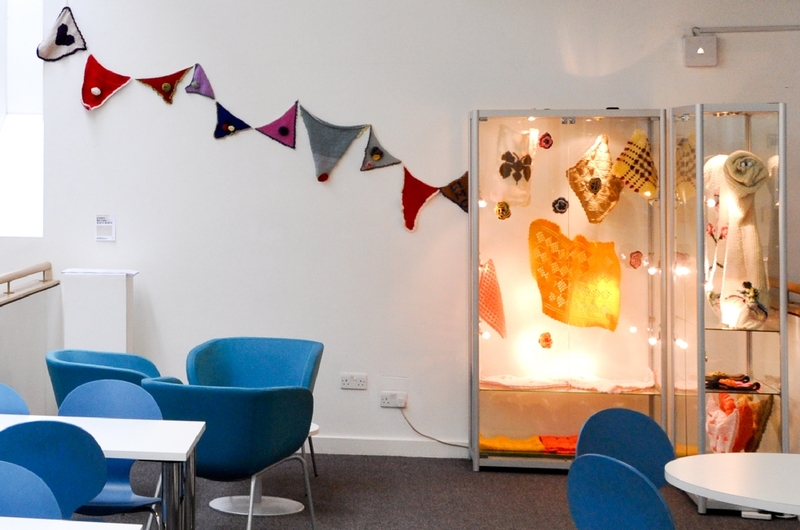 The bunting in fact plays a large role in making a meaningful connection between the two exhibitions through similarity in material.